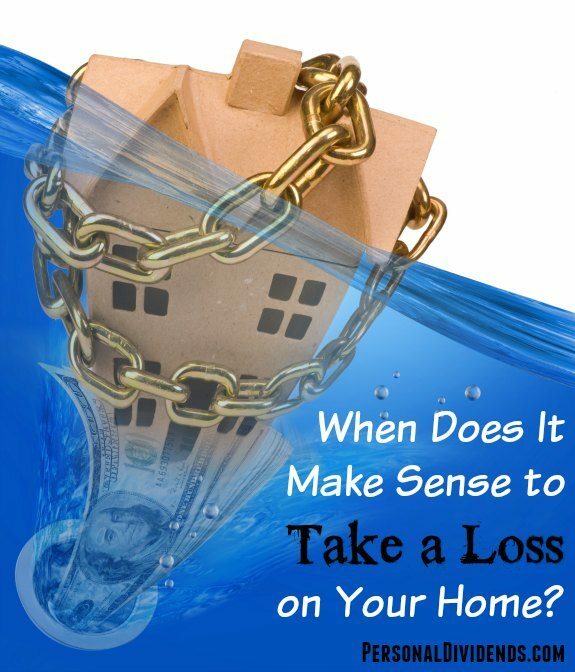 When Does It Make Sense to Take a Loss on Your Home? I had been writing about personal finance long enough (and I had read Rich Dad, Poor Dad) to realize that buying a residential home with a mortgage hardly qualified as an investment. But, even so, we went ahead and bought. We figured, at the very least, we might break even. Those dreams of breaking even died a painful death about two months ago. My husband got a new job across the country and we had to move. The question became this: What do we do with our home? We knew that there was no way that we were getting back what we paid for our home. We had bought near the top of the market, and things in our neighborhood were still on the downslope. However, even though we weren’t upside down on your mortgage, the fact remained that our home was “worth” $20,000 less than when we bought it. I originally thought that we’d have to pay about $10,000 to get rid of the home, but the final numbers put it closer to coming up with $8,000 cash to make the sale go through. It’s not super-awesome, and it’s not fun to come up with that kind of cash, but it’s what we had to do to make it happen. Can you swing the cost? First of all, you have to figure out if you can swing the cost. Do you have the resources to make it happen? If you can’t get the cash together, whether or not it’s worth it is a moot point. You might have to stick it out for a few extra months to amass the capital needed to get out from under the house. How do you feel about being a landlord? Next, consider how you feel about being a landlord. In some cases, it makes sense to rent out your house. If you can get enough in rent to at least cover the mortgage and maintenance costs, renting might be a better option. You should also consider whether you live close enough to make it workable, or whether you can hire a property manager at a reasonable cost to make it work. If you don’t want to deal with the hassle of being a landlord, it might be worth it to pay what it takes and be done. Do you just want to be done? Part of the reason we proceeded as we did was because we just wanted to be done. We had the financial resources, we didn’t want to mess with being landlords, and we just wanted the sale over and done with. It was worth it to us to cut the house loose, and then move on with our lives (and finances). Of course, not everyone comes to the same conclusion. You might be in a different situation, and it might not work for you to take a big loss and pay to get rid of your home. Carefully think things through, and then make the decision that makes the best sense in your situation.